If you’re in the market for a condo you’ll already know buying isn’t getting any easier. 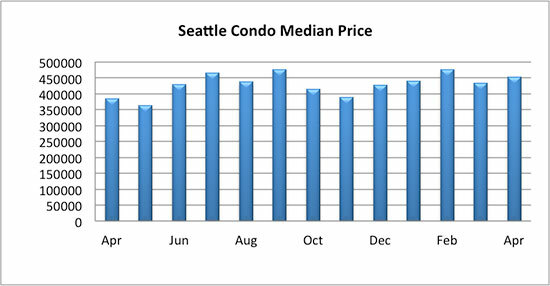 Seattle condo prices continued to rise last month as the market constricted further without the cyclical upswing in inventory we normally see in spring. 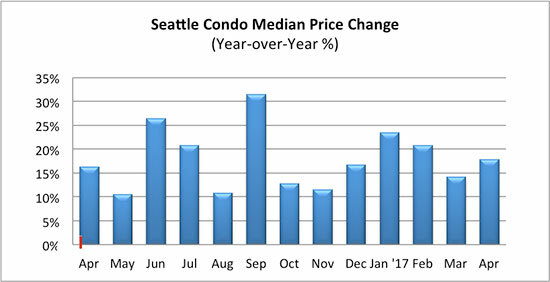 The citywide Seattle condo median sales price rose 17.9% over last April to $452,500, which also reflected a one-month improvement of 4.3%. 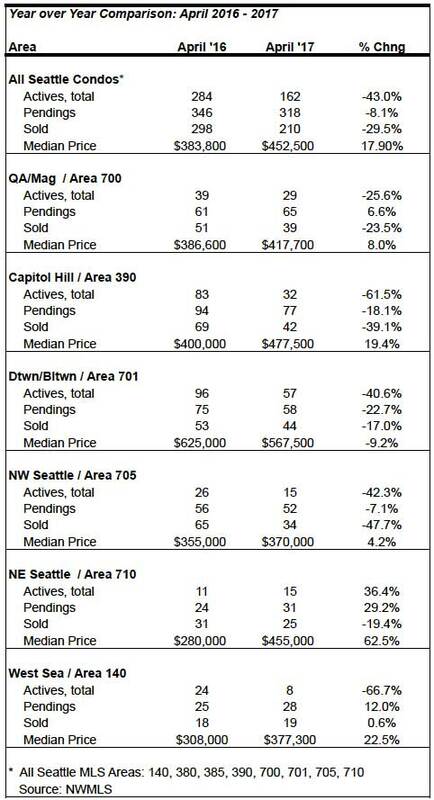 All areas of the city experienced an increase with the exception of the downtown / Belltown area, which dipped 9.2% from the same period a year ago (see table at bottom of post). Typically, spring exhibits one of the most active periods of the year as buyers enter the market and sellers put their condos on market for sale. 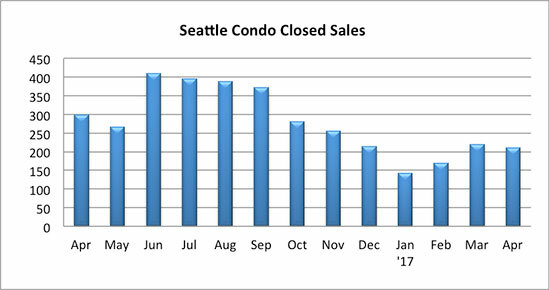 However, last month we remained flat with only 162 condos for sale in Seattle in April, a 43% decrease from last year. The inventory supply rate dipped further to 0.5-months of supply. 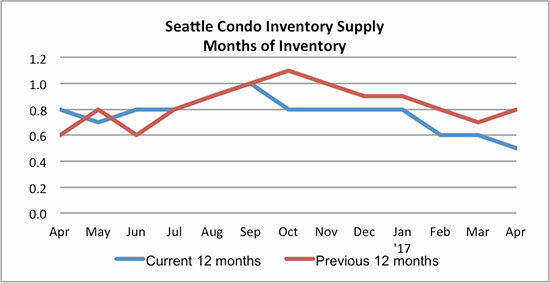 In essence, what that means is if no new condo listings come on the market, at the current rate of sales, it will take 1/2 month to sell out the current inventory of Seattle condos for sale. The supply rate is a metric of market conditions and a rate of less than 3-months of supply is indicative of a seller’s market. 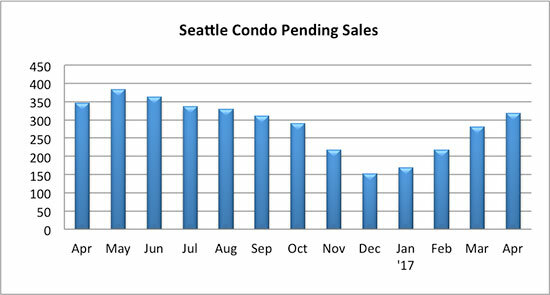 Seattle has been in a seller’s market since 2012 and will remain so for years to come given the lack of new construction. For comparison sake, the last time we experienced a hearty buyer’s market was back in 2010. The number of pending sales (listings with accepted offers) rose 8.1% year-over-year and 13.2% from the prior month to 318 units. Technically, the number could be a bit higher since Nexus has not included their pending transactions in the NWMLS. 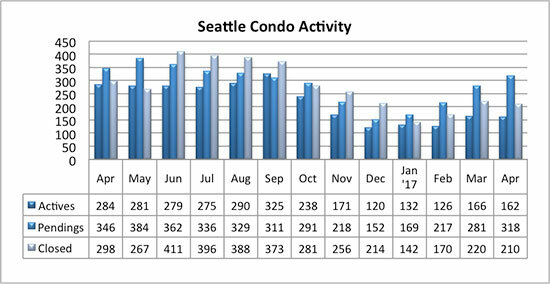 The number of closed condo transactions reduced in April to 210 units, a 29.5% year-over-year and 4.5% one-month decrease, respectively. If you’re a owner contemplating selling, the current market condition and buyer demand presents a terrific opportunity to sell your Seattle condo. Want to know what your condo is worth? If you’re a buyer, let us help you navigate through Seattle’s crazy housing market and beat out the competition to purchase your new home.